(Photo: LWF / DWS Nepal)Relief efforts in Nepal in May 2105. Aid agencies backed by Christianity and Islam have shown they can work together in an earthquake-stricken country such as Nepal where 80 percent of the people are Hindus and nine percent are Buddhists. The Lutheran World Federation and Islamic Relief Worldwide say they are working together to provide shelter for 12,000 of the most vulnerable people in the 14 worst-affected areas following the April Nepal earthquakes. Police have said that more than 8,635 have died as a result of the 7.8 magnitude April 25 earthquake with over 300 people missing still and at least 2 million people in Nepal are without homes. The joint Lutheran-Islamic relief project will ensure that 12,000 people in five remote villages in Rasuwa district, north-east of Kathmandu receive temporary homes Lutheran World Information reported. This will occur before the onset of the monsoon and the following cold winter seasons. The quake was so powerful the world's tallest peak, Mount Everest, moved three centimetres (1.2 inches) to the southwest because of the Nepal earthquake that devastated the country in April, the Chinese Daily reported June 16. China's National Administration of Surveying, Mapping and Geoinformation found that the 7.8-magnitude quake reversed the gradual northeasterly course of the mountain. The LWF-IRW project will target those most in need, including people with disabilities, the elderly, women, children, nursing mothers, and people from marginalized communities such as Dalits, religious minorities and indigenous nationalities. "This is a time when we as faith-based organizations have to say very clearly that religion is not a stumbling block, but an added value in emergency aid," said LWF general secretary Rev. Martin Junge. "In Nepal, we have a coexistence of many different beliefs. When disaster strikes, communities have to pull together to help the most vulnerable," he noted. Dr. Mohamed Ashmawey, CEO of Islamic Relief Worldwide agreed that religion is an "added value in emergency aid." He said, "In Nepal, it is absolutely vital that we target aid towards those who need it most. "Islamic Relief has vast experience in humanitarian work and has responded to disasters in the Philippines, Pakistan, and Indonesia, amongst other locations." Ashmawey said, "We look forward to working with LWF, sharing expertise and serving communities in Nepal." The LWF has worked with marginalized communities and on disaster response in Nepal for 30 years and IRW wishes to collaborate with the LWF. The Islamic group can access the LWF's existing experience on the ground and sharing the diversity of our experience in responding to disasters across the world. In August 2014, IRW and the LWF signed a Memorandum of Understanding to collaborate on humanitarian work. It marked the first official cooperation between a global Christian communion and a worldwide Islamic non-governmental organization. 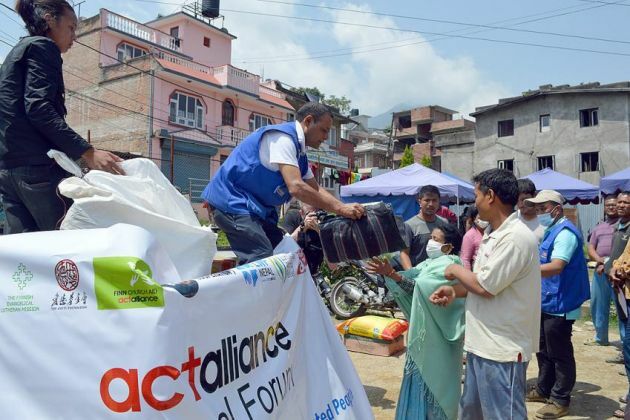 The joint Nepal earthquake emergency response will be the third cooperative project for IRW and the LWF. The two organizations have been working together with Syrian refugees and host communities in Al Mafraq in Jordan, and plan a project in the Kenyan refugee camps at Dadaab.